Great size for front door. Love the metal star with the outer wreath. I already have a blue front door and this looks great. Hope it lasts a long time! Metal decorations are bright and hold up so well. This wreath is smaller than most, but does show up on the front door. Took away one star for the size. My home is decorated in Western decor! Will be PERFECT! It will look very nice and balance the front of our home for Independence Day !! Ive been looking for these and YOU had them-great! Liked the look and quality. Because I loved the look. All my decor on the front of my home is red, white and blue and I thought this would look so cute on my front door. It's perfect for my front door and matches my other Americana-style decor.. I love anything that is barn stars. I like this kind of stuff. It is great!! I need something for my door, for 4th of July, Memorial Day, Veterans Day, etc. 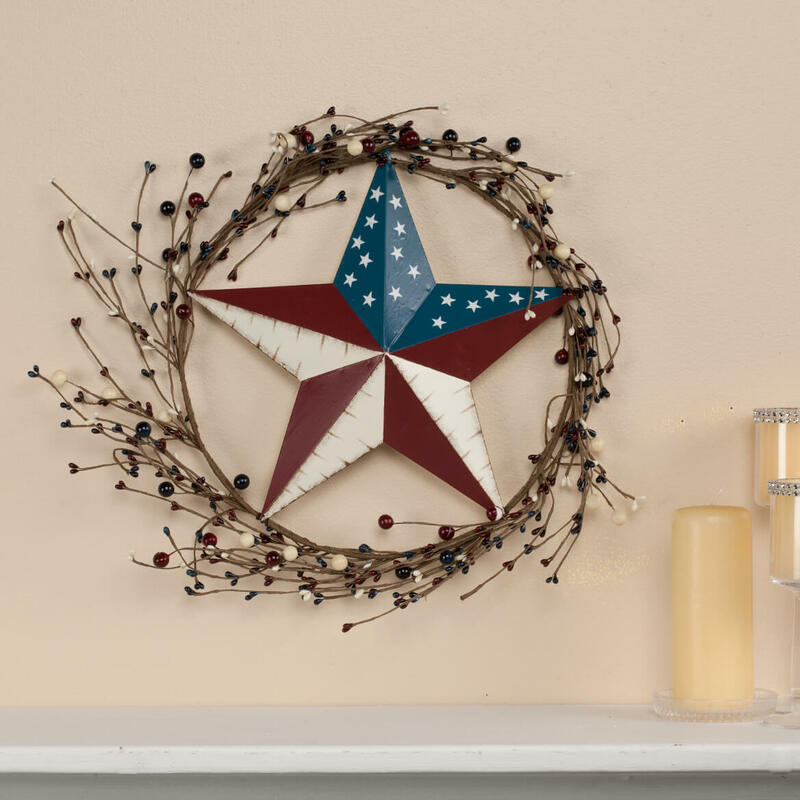 I have been looking for a patriotic barn star to hang on our garden shed and a patriotic star wreath for our front door. Patriotic door hanging. Hoping it will be as decorative as it looks. Its perfect for Memorial Day, Labor Day and Veterans Day. Very lucky find. Love to show my American Spirit! What is the size of this wreath? BEST ANSWER: Thank you for your question It is a 14" diameter. We hope this information will be of help to you. 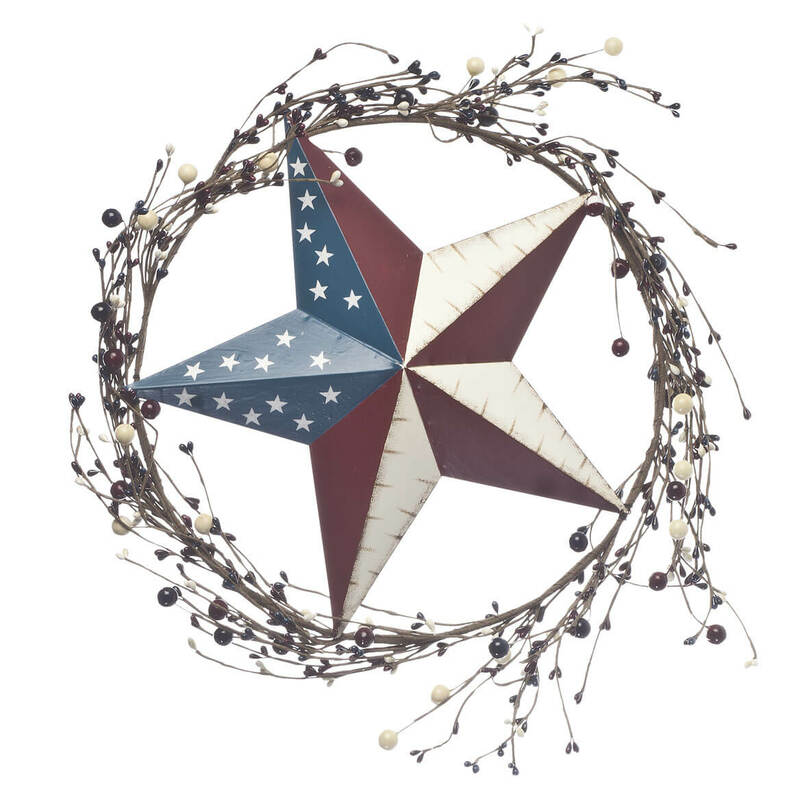 The wreath is about 15 inches in diameter with the star being a little less than 12 inches across.